The story is told that Bacchus, the Greek god of wine, was insulted one day by a mortal. Enraged, he called forth vicious tigers to exact revenge on the next mortal who would cross his path. This unfortunate individual was the maiden Amethyst who was on her way to pay tribute to the goddess Diana and found herself face to face with the tigers of the vengeful Bacchus. To save her from the beasts, Diana turned the innocent girl into a stature of pure crystalline quartz. Amethyst was so beautiful that Dionysus, in sorrow and remorse, wept tears of rich wine over the statue.His tears stained the quartz creating the gem which still bears her name. In folklore, Amethyst is believed to keep you clear headed and, traditionally, it symbolized peace and tranquility. The amethyst is February’s birthstone and it is associated with many myths and legends. Both ancient Greeks and Romans considered it a remedy for intoxication. Legend has it that drinking from an amethyst goblet would prevent inebriation. Many clergymen have worn amethyst because it was thought to bring emotional balance and quiet wiles of the spirit. High figures in religious sects and royalty have treasured it because of its royal purple color. The only active amethyst mine in North America is nestled in the four peaks of the Mazatzal Mountains forty miles northeast of Phoenix, Arizona. This twenty acre mine site is gated and trespassing is prohibited. Due to the remote location of this mine, supplies for the miners must be flown in by helicopter. Amethyst is available in a wide range of quality. 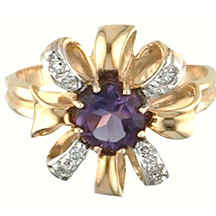 The finest amethyst historically originated in Russia consequently is featured in much of Europe’s royal jewelry. Today Africa is an important source of Amethyst. Paler colors of amethyst are often found in South America. Amethyst has such a wide color range that there is a shade that works for practically everyone; from the deep purple hues that work well for those who go for the bolder gem tones to the pale lavender for those who prefer lighter shades and more whimsical color schemes and all the lovely shades in between. That may be one reason why amethyst is the most popular of the quartz family of gemstones and continues to enjoy a wide appeal year after year. Other reasons may be its beauty, affordability and stability. Amethyst is rated good for everyday wear and scores 7 on the Mohs Hardness scale for gemstones with diamond scoring 10.